Barcelona took on La Liga rival Atlético Madrid and finished in a 1-1 draw despite Barcelona dominating for most of the contest. 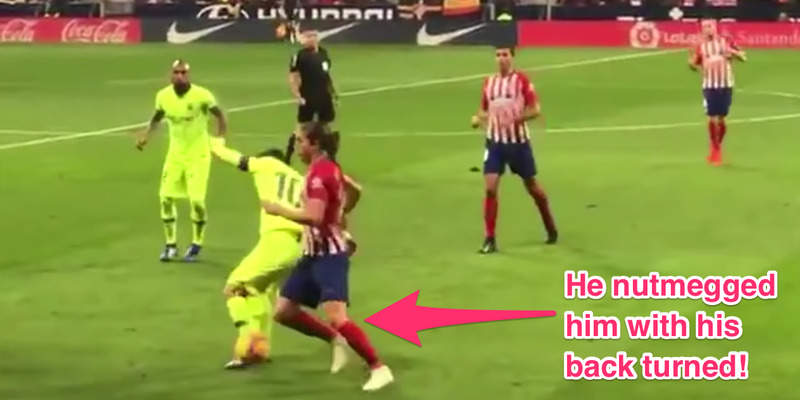 Argentinian superstar Lionel Messi stole the show Saturday, leaping into the air to trap the ball with his head before pulling off an unbelievable nutmeg on Atlético Madrid’s Filipe Luís in the 21st minute of play. Fans took to social media to debate whether or not Messi could have possibly intended to pull off such a challenging feat and they have yet to come to a consensus. Fans have known for quite some time now that Argentinian superstar Lionel Messi has other-worldly abilities on the pitch, but Saturday he took an opportunity to remind those who still had any doubts. Messi – who has won a record-tying five Ballon d’Or awards and led Barcelona to nine La Liga titles – stole the show in Barcelona’s 1-1 draw against Atlético Madrid when he managed to nutmeg Atlético Madrid’s Filipe Luís with his back turned in the 21st minute of play. Messi lept into the air to secure a loose ball with his head before warding off Luís when he came in for the challenge. As the ball landed at his feet, Messi used the outside of his left foot to flick the ball through his opponent’s legs. He managed to shake the two Atlético Madrid defenders on his heels to maintain possession and start the attack for Barcelona. Fans quickly took to Twitter to debate whether or not Messi could have possibly intended to pull off the challenging feat. So far, it doesn’t look as though anyone has reached a consensus. It's an incredible touch from Messi but there's no way he meant to nutmeg him. Can’t believe I’ve only just seen that Messi nutmeg, greatest player to ever grace the Earth. FACT. He’s maybe the best player ever to play football.